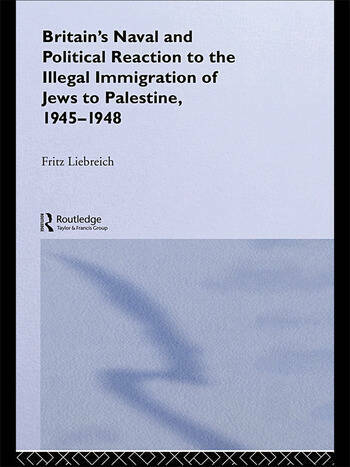 This book provides an important shift in the analysis of Britain's policy towards the illegal postwar Jewish immigration into Palestine. It charts the development of Britain's response to Zionist immigration, from the initial sympathy, as embodied in the Balfour Declaration, through attempts at blockade, refoulement and finally disengagement. The book exposes differences in policy pursued by the great departments of state like the Foreign, Colonial and War Offices and their legal advisors, and those implemented by the Admiralty. The book argues that the eventual failure of Britain's immigration policy was inevitable in view of the hostility shown by many European nations, and America, towards Britain's ambition to retain her position in the Middle East. Freddy Libreich was born in Vienna in 1927, who went to Palestine illegally in 1939. He is an avid historian and expert on the British navy's attempts to stop illegal jewish immigrants from reaching Palestine up to 1948. He left school at 14 to become a mechanic, and engineer; and started his studies again on retirement at 62. He has completed his Masters, and PhD at Kings College London.